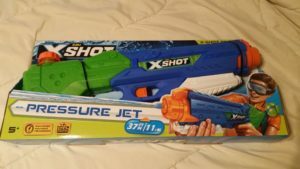 Before all the secondhand news from Toy Fair kicks in, I thought I’d try to get out some reviews of the newest pressurized water blasters this season. Hasbro is content with piston-type blasters for the Super Soaker line; this leaves smaller competitors the chance to shine with high-performance, budget-friendly blasters. In the case of Zuru, that means the Xshot Pressure Jet. 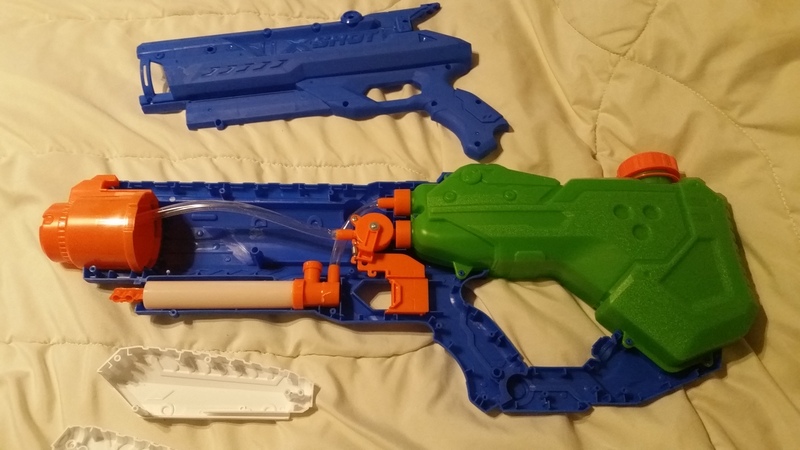 The Pressure Jet (listed as the Hydro Jet on the Xshot website) is an interesting mix of plastic. The main body and pump grip have a cheaper feeling, like you’d find from some discount store toys. The reservoir, front, and main parts, however, are molded from better plastic. Regardless of the plastic feel, the blaster as a unit feels solid, with plenty of room for your dominant hand. The shoulder rest molded into the back of the reservoir is adequate. 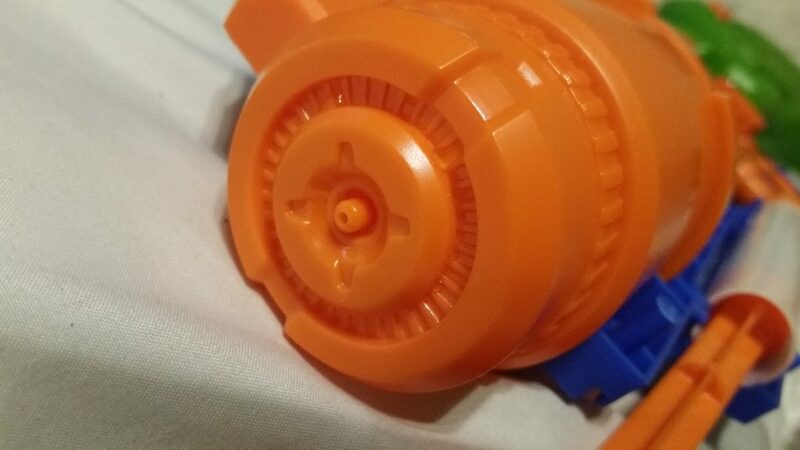 Opened up, you can see that the blaster is incredibly simple. After you fill the reservoir, you put on the cap, pump it full of air to pressurize, then pull the trigger. 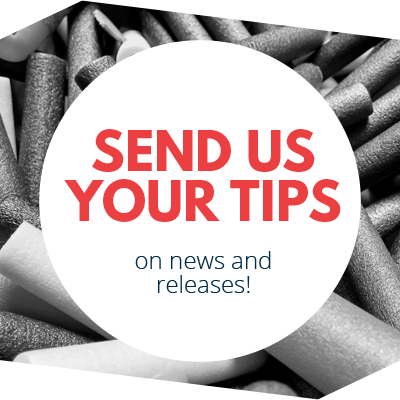 The trigger swings a small ball valve, with a long tube leading to the small nozzle. A tube inside the reservoir enables full use of your load of water. Naturally, you should always depressurized your blaster before refilling the reservoir. Not doing so may result in a blast of air to the face, if not a the cap. 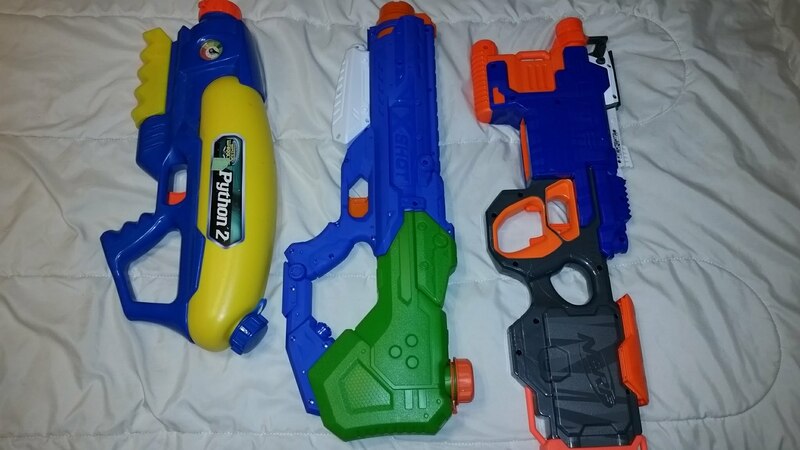 Compared in size to the Water Warriors Python 2, and a Nerf Hyperfire. The Pressure Jet holds 1360mL in the reservoir, as advertised. Shot times, however, are highly dependent on the reservoir level and the air pressure levels. Early shots will require fewer pumps for full strength, but have shorter duration. Medium to low reservoir levels will require lots of pumping for the same pressure, but will result in shot times easily exceeding half a minute. It’s just the nature of pressurized reservoirs this size. The small nozzle, of course, favors shot time over shot power. The thin stream is very consistent, however, nearly to the end of its range. In terms of ranges, I was hitting 35′ with angled shots and quite a few pumps. The longest duration shots stayed at this distance for several seconds, and even after were hitting 25′-30′ for quite a while until the pressure dropped. 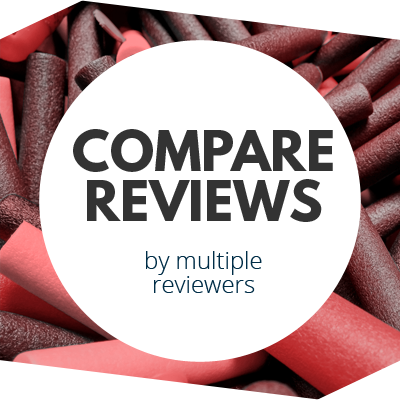 I’m still deciding a good way to do rankings for water blasters, compared to how I usually rate dart blasters. 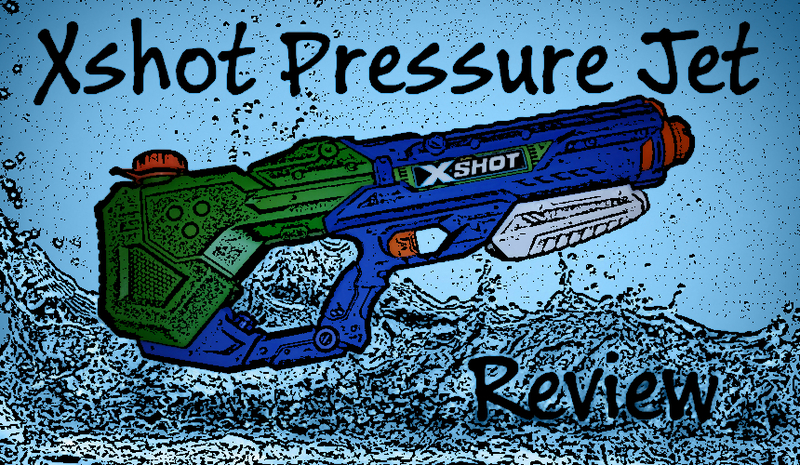 In the meantime, I’ll say this: the Xshot Pressure Jet is a great blaster, especially compared to the large number of pump-and-shoot blasters available on the market. Ignoring the neighborhood kid that has a CPS 2000, this would do decently well in any sort of soaker war. What it lacks in sheer power, it makes up for in endurance. 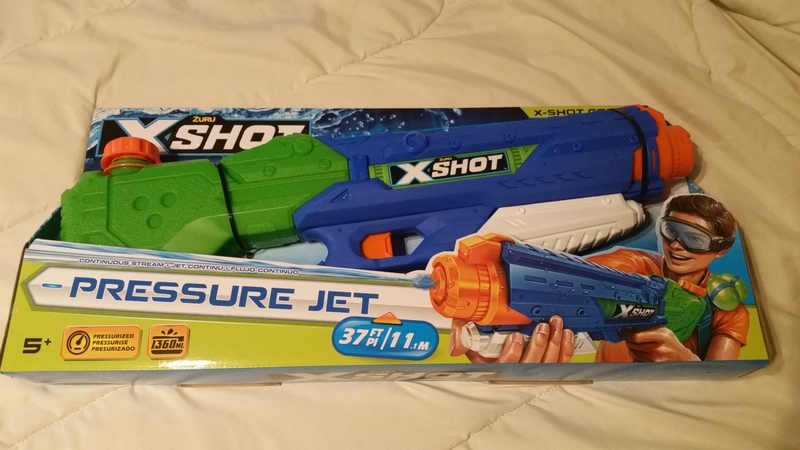 This entry was posted in Reviews, Water Blasters and tagged 2018, blaster hub, pressure jet, review, super soaker, water blaster, water gun, xshot, zuru on February 5, 2018 by BuffdaddyNerf.